Type and size suitable for white water and grade and size/weight of paddler. Grab tapes front and rear. Fixed buoyancy front and rear. Full plate footrest securely fitted. From the steep water fall runs of the Scottish Glens to the boulder garden rapids of North Wales and the high moorland rivers of the English Moors, Britain has a long tradition of white water kayaking. From early on in the development of kayak design, British kayakers have explored across the globe's mountainous regions in search of wild rivers and paddling adventures. From the 1940's paddlers in canvas kayaks, opened up runs through out Wales and Scotland, paving the way for paddlers with glass fibre boats to push onto steep rivers at home, and larger volume runs in the Alps and beyond. The now famous first descent expedition in 1976 to the Dudh Koshi river that flows off Mount Everest, placed a team of British paddlers amongst the pioneers of white water kayaking. Since them, boat design and materials, along with mass air travel and the expansion of personal leisure time, have opened up the white water kayaking to wide participation from all comers to all corners of the globe. White water kayaking destinations, like the Alps, Norway, the Rockies, the Zambezi, the Andes, Southern Alps and the Himalayas now attract countless paddlers, and within whom you are likely to find someone from the UK. White water kayaking is simply the decent of rapids in a kayak. The experience in essence is straight forward, you arrive at the put in on your chosen run, head down river on an adventure with your friends, may be into an unknown canyon or on a regular run or perhaps the trip may take several days to undertake, either way the fun is intoxicating, the action aplenty and enjoyment addictive. Within white water kayaking, there are many aspects of the sport, and these are often reflected in the nature of the white water and seriousness of the rapids. The international scale of white water is from Grade I to Grade VI, with Grade I being straight forward and near placid and Grade Six being at the limit of personal and technical paddling. 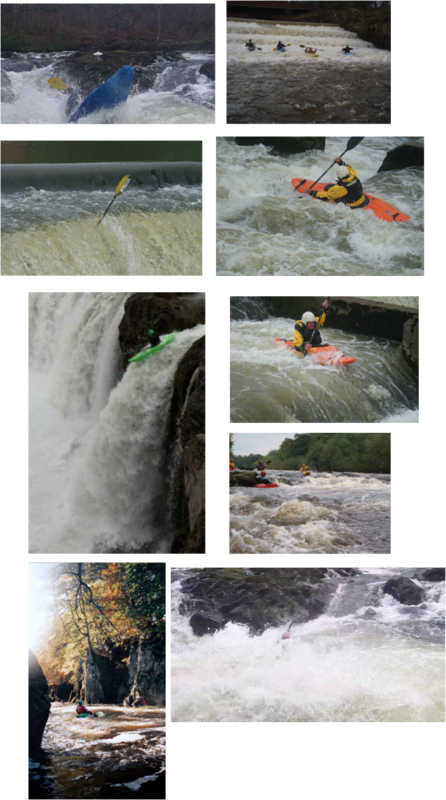 Most white water kayaking in the UK, is on low to medium river runs with Grade II and III rapids, such as the Tay in Scotland, Dee in Wales and Tyne in North England. Higher into the hills, lower volume runs, steeper in nature can be found, this steep creeking is more Grade IV and V, where rapids and drops are run with more specialist kayaks. On wider more volume runs, river features such as waves and stoppers attract playboaters, who surf the waves and make tricks in specialist freestyle boats. White Water kayakers have long challenged each other to run cleaner lines or faster times on rapids and drops, the competitive elements of this is Slalom Kayaking on a set gated course or Wild Water Racing from point A to B down a section of river. Both these past times are competitive disciplines that have developed their own highly specialist kayaks.